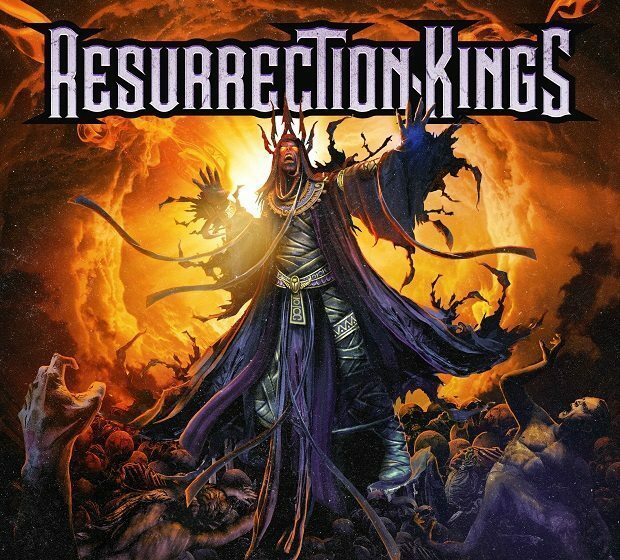 esurrection Kings are a band put together by Frontiers Records around one-time Dio guitarist Craig Goldie and vocalist Chas West, who had worked with Foreigner (amongst others). They’re rounded out with the addition of fellow Dio alumnus Vinnie Appice on drums and former Dokken and Quiet Riot bassist Sean McNabb. pelin and Rainbow. The reality is that the record, cobbled together from a collection of demos by Goldie and West, and filled out with material written by one of Frontiers Records’ in-house songwriters, falls well short of those illustrious touchstones. Much of it is as formulaic as song titles like “Livin’ Out Loud”, “Fallin’ For You”, “Never Say Goodbye” or “Had Enough” would suggest. It’s all immaculately played and produced, has riffs and choruses in all the right places along with plenty of solos that sound like a whinnying horse being strangled. There’s nothing here you’d describe as unlistenable. But there is very little that really stands out, and in the end it all sounds much like what you’d expect from a supergroup made up of bit players from the stories of other far bigger stars. This is the sort of band you can imagine playing a mid-afternoon slot at a festival while you’re waiting for the acts you’d really come to see. Which is a shame, because Chas West has a great old-school hard rock voice of the sort you don’t hear enough of nowadays, and sounds as though he’d excel given stronger material. The occasional song, most notably “Who Do You Run To?”, hints at the potential for something greater, with its brooding verse, the best hook on the album, and an imaginatively melodic instrumental break. As a massive Dio fan I’ve never rated Craig Goldie as a guitar player. Dream Evil is one of the weaker Dio albums. Not sure what Vinny Appice is doing in this given how strong the new ‘Last In Line’ album sounds?